Richard Cole has graduated twice from Plymouth University and works as an Engineering Manager for Tamar Bridge & Torpoint Ferry Joint Committee. I worked for a major civil engineering contractor for the first two years after graduating, before joining a local civil/marine engineering contractor. I then spent time with both contractors working all over the UK and the Channel Islands. I then moved to a large engineering consultancy working on highways and tunnel schemes. I finally joined my current employer where I have been for approximately 11 years, managing engineering, maintenance, and construction projects. 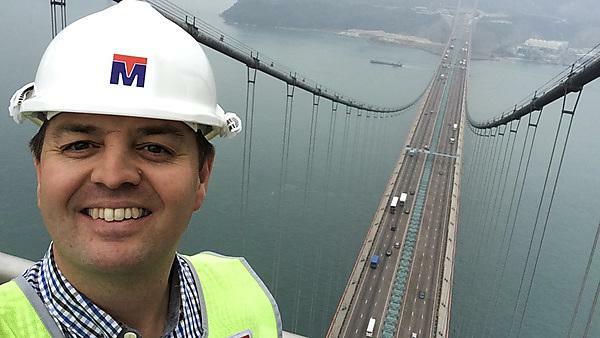 I have been privileged to stand on the very top of some of the world’s largest long span bridges at home in the UK, in Europe, America and Asia. I’m a bit of a big bridge nerd! On a professional level, becoming a member of your chosen professional institute/institution is important. It will help with your career progression, it will be recognised amongst your peers, and you may increase your employability and earning potential as a result. It took me too long to grasp this nettle! On a personal level, take time to travel, play sport, immerse yourself in your chosen hobby – make sure your work/life balance is balanced! I still struggle to grasp that particular nettle! Play harder, work harder. It’s easy to forget the main reason why you’re at university, so my top tip is to maximise your potential by hard graft during those three or four years to increase your graduate opportunities. Treat it like you’ve already got the career/job of your dreams. The main reason why I choose Plymouth was because of the degree course: it was an opportunity to complete a degree with diving, in a coastal location, at a university with a great reputation. The University has changed a lot (and improved a lot) in recent years, and some of the current support networks weren’t in place for me. There’s so much on offer now. I think this reflects the changes in expectations of today’s undergraduates. The three closest friends (and now their young families) in my life today are those that I met on the first weekend in halls as a baby-faced fresher. We completed our degrees together, with many highs and lows, and have been lifelong friends ever since. Plymouth provided the foundations for my career to date and I returned to complete my MBA some years after graduating from my first degree.